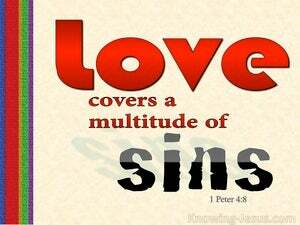 ﻿ 1 Peter 4:8 Above all, keep fervent in your love for one another, because love covers a multitude of sins. Above all, keep your love for one another at full strength, since love covers a multitude of sins. But, above all things, have fervent love one for another; for love will cover a multitude of sins. Above all, hold unfailing your love for one another, because love covers a multitude of sins. but above all, let your mutual benevolence be intense, for benevolence cancels a multitude of offences. And above all things, have fervent love to one another; for love will cover a multitude of sins. Above all keep your love for one another strong, because love covers up a host of sins. And above all things, have fervent love to each other; for love will cover a multitude of sins. More than all having intent love among yourselves: for love shall cover a multitude of sins. And above all things have fervent love among yourselves: for love shall cover a multitude of sins. Above all, keep your love for one another constant, because love covers a large number of sins. And above all things have fervent love to yourselves, for love will cover a multitude of sins. 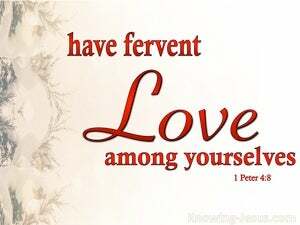 But above all things, have fervent love among you. For love covereth the multitude of sins. Above all, be keen to love one another, for love hides a host of sins. Above everything have fervent love to one another; for love veils a multitude of sins. Above all keep your love for one another fervent, because love covers a multitude of sins. Above all things be earnest in your love among yourselves, for love covers a multitude of sins. And above all things have fervent love among yourselves; for love covereth a multitude of sins. above all things have fervent love one for another, for love hides a multitude of sins. But above all things have fervent love towards each other: for love will conceal a multitude of faults. And above all things have fervent charity among yourselves: for charity will cover a multitude of sins. Above all continue to love one another fervently, for love throws a veil over a multitude of faults. Above everything else keep your love for one another fervent, because love covers up a multitude of sins. 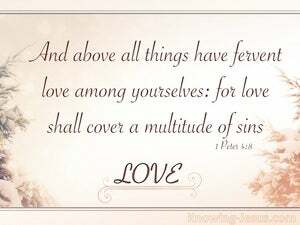 And above all things be earnest in your love among yourselves, for love covers a multitude of sins. having above all things fervent love to each other; for love will cover a multitude of sins. let him know that he who turns a sinner from the error of his way will save his soul from death and will cover a multitude of sins.